Apr. 14th, 2010 - Apr. 14th, 2015: five years without the Green Man. Starting from today,"This Man of Steel", the Type O Negative Italian tribute compilation released by Darkitalia in loving memory of Peter Steele is available for free download and listening via Bandcamp. Date at Midnight are proud to be part of this initiative with a version of the iconic song "Black No.1". Date at Midnight back to Germany! We are proud to announce that we will perform during the fifth edition of Campus Noir Festival www.campus-noir.de in Ilmenau (Thüringen). Our show will take place on Saturday, Sept. 26th. More German dates to be announced soon, stay tuned! 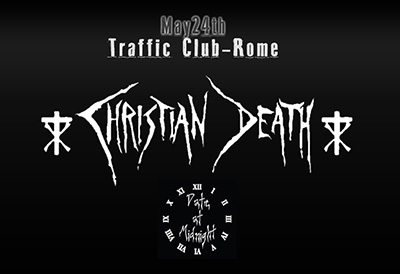 Date at Midnight will open Christian Death gig in Rome on may 24th, 2014 - Catastrophe Ballet 30th anniversary Tour. 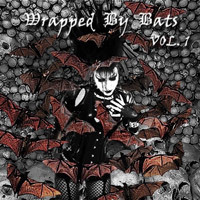 Vicious and Liar is included on Wrrapped by Bats vol.1! More than 20 bands from the goth-post punk world! NO LOVE now on iTUNES and Audioglobe!